It was a hot summer Sunday and my husband and I decided to take our two grandchildren with their bicycles for a ride around our local lake. Of course, a visit to the lake wouldn’t be the same without taking brown bread and feeding the multitude of ducks and geese that inhabit the lake and its island. There are probably around 200 geese and ducks at the lake. They are all hungry, surviving only on the grass that surrounds the lake. Once a year there is a massive cull of these geese, but they soon recover in numbers in the spring. My two grandchildren, armed with their packets of bread, began feeding the geese and were soon overwhelmed as the birds left the water and surrounded them, squawking and grabbing bread out their hands. Then, in the midst of all the noise, feathers, ducks and geese swimming about, swam a tiny, yellow gosling. 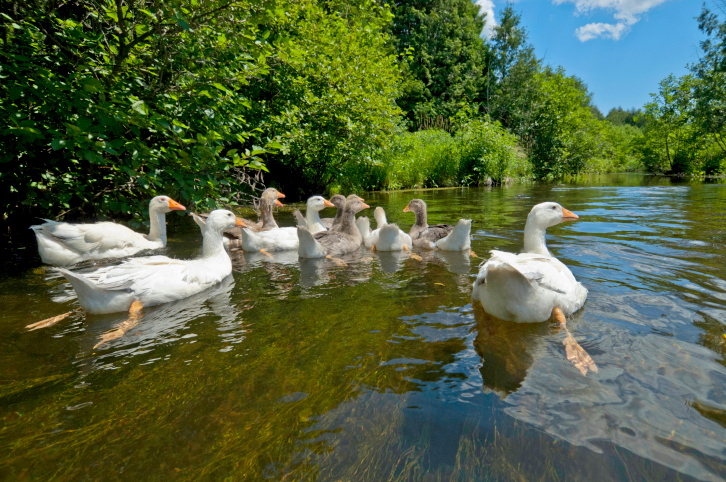 On many bodies of water, there is conflict between geese and humans. The days passed in a blur of feeding, talking to and raising Goose. I put him in a big wired pen and my other two ducks and my three dogs took a great interest in him. I sat with him for hours talking to him and pointing out juicy patches of grass to him. Goose grew big and strong, started eating on his own and his fluffy down was soon replaced with magnificent white feathers. His voice grew from a squeak to a squawk and I watched with pride, as he developed into a beautiful bird. The intention was always to release him back onto the lake. But as time passed, Goose fell in love. He followed his love interest around, spoke to her continuously in a soft chipping sound and wanted to be around her always. The only problem with that was that I was his love interest. He had imprinted on me and would not let me out of his sight. When I was doing chores in the house, there was Goose -- often lying down on the carpet and falling asleep until I was finished. He followed me into the bathroom and when I showered, he showered too with the little droplets of water that landed on his feathers. He discovered TV and watched with his head to the side. When he got bored, he waddled outside to the pond, where he declared his total ownership of the water and would not allow the other ducks to use it. He was very grumpy when he couldn’t get into the house and be with me, and would squawk loudly and jabber in a grumpy goose voice till I came out again. He was a happy bird, strong and lively, and had the run of a very big garden and pond. But something was missing from his life -- and that was companionship. So one night my husband brought home a big cardboard box and inside was the answer to our prayers. A big, beautiful grey female goose. At first Goose showed no interest, nipping her and chasing her. But she was persistent and followed him everywhere, and she eventually won him over with her charm. Here is dear Goose enjoying a walk in the garden.